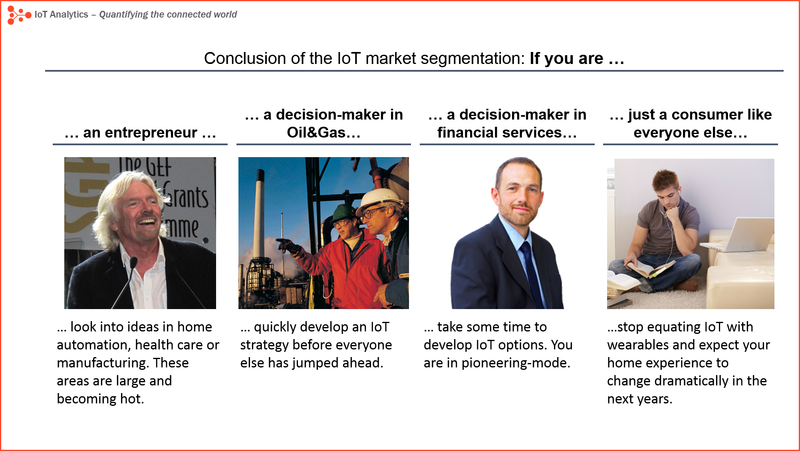 Specifically Oil&Gas as a subsegment of manufacturing is currently leading the IoT adoption along with the energy sector as well as applications in mobility and transportation. 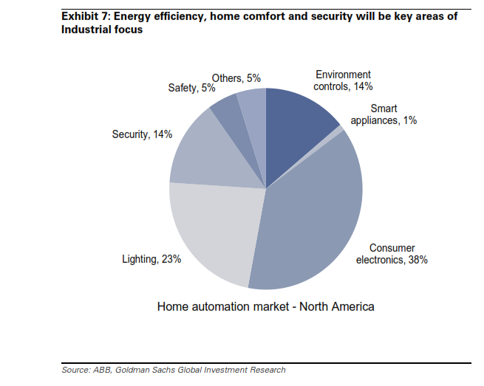 Within consumer-facing applications, Home automation will dominate the market in the next years (smart thermostats, security systems, and refrigerators). The wearable hype seems to be over. 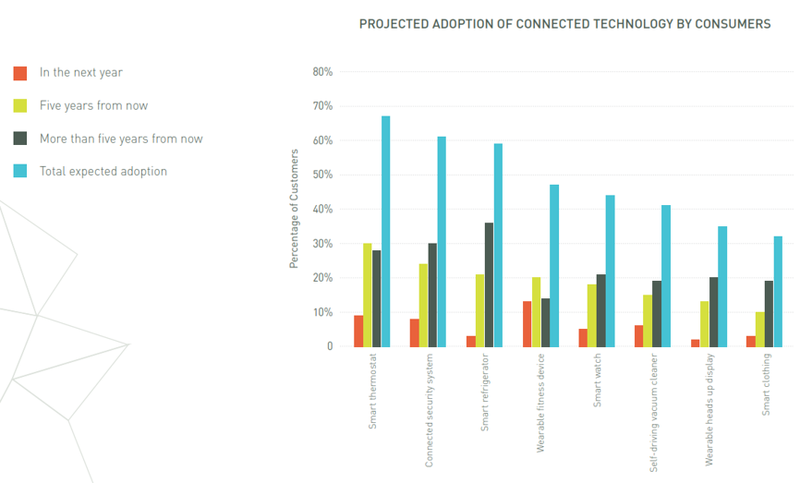 By 2020 for every person there will be at least 2 connected devices, maybe even 6. The economic impact of IoT could surpass the size of the German economy within 10 years. Building on this analysis, I have looked one level deeper. This time I interpreted forecasts and surveys regarding market size and investment activity in different segments of the IoT market. I solely focus on the first. There will soon be another article in which I will also talk about IoT technology. 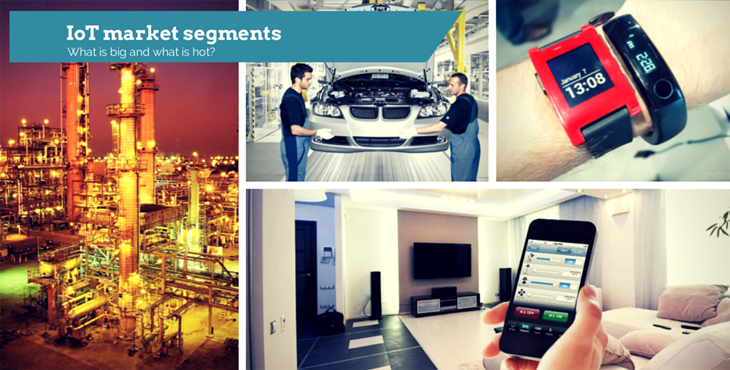 Together with other IoT experts, we have developed a market segmentation that is suitable for understanding the IoT ecosystem. See below. It distinguishes consumer-facing IoT and business-facing IoT. 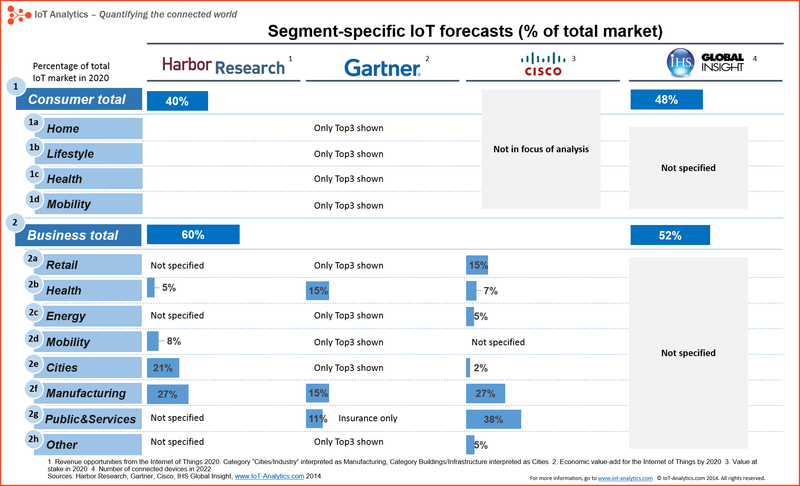 Companies active in the IoT Consumer segment like the wearables manufacturers have very little overlap with industrial IoT companies like Cisco because their customers are different. It depicts main categories that play a major role in terms of importance and which are clearly different from each other. I will use this segmentation to compare all existing reports and data points: Comparing segment forecasts, then surveys, and finally giving application examples for the most important applications. I have come across 4 publicly available reports that try to forecast revenue or device specific development per segment. The picture is by no means complete. It seems that Cisco and Harbor have missed important segments in their analysis or at least not labeled these. Gartner has not missed them. They are only publicly disclosing the top 3 segments. Manufacturing will supposedly be the largest segment of IoT (potentially more than ¼ of the total IoT market). In addition to the forward-looking segment-specific market forecasts, there are a number of surveys that are examining where money is being invested and what the industry/application adoption rate is. The only notable survey on the consumer side was recently performed by the Acquity group, a subsidiary of Accenture. Acquity polled more than 2000 US consumers to estimate the likely adoption of different technologies over the next 5+ years. Unfortunately the survey did not poll about any consumer health applications such as remote health monitoring. Home automation: Since the acquisition of Nest by Google earlier in 2014, the broad public has become aware about home automation. Goldman Sachs predicts that it will be mainly consumer electronics as well as lighting that will emerge as the “key areas”. 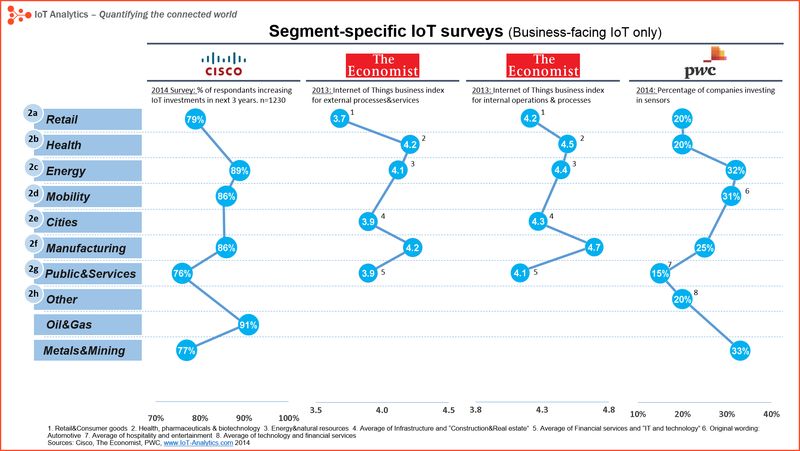 There are a number of business-facing Internet of Things surveys. In contrast to the market forecasts, these surveys don’t rank the different market segments in terms of size but in terms of business activity. In order to facilitate their interpretation, the surveys are plotted into one graph below. Retail as well as cities, the public sector and commercial services such as “financial services” are lagging behind in IoT investments and adoption. The view on healthcare as well as metals&mining IoT market segments is very divergent: While the Economist rates the business index in healthcare as rather advanced, PWC sees little sensor investment in this area. And while PWC is measuring the highest sensor investment rate in metals&mining, Cisco is measuring the second lowest investment activity, compared to other industries. Manufacturing: It is no surprise that two of the keynote speakers at the recent IoT World Forum in Chicago came from Oil&Gas as well as mining companies. Both John McGagh, Head of Innovation at Rio Tinto, as well as Arjen Dorland, VP of technical and competitive IT at Shell, highlighted the enormous potential of IoT in their industries. It is the ability to perform remote operations on extremely high-value assets that makes the IoT business case so compelling for these industries. On his desktop in Chicago, John McGagh showed how he could visualize operations data in one of Rio Tinto’s mine in Utah in real-time. He showcased remote monitoring of tire pressure, fuel level, and vehicle load for all the vehicles in the mine in real-time. According to him it allows Rio Tinto to make smarter dispatching and maintenance decisions. What are your thoughts? Are the numbers mirroring your sentiment? Let me know. I would recommend to update the number on connected cars, we expect shipments of all type of connected cars of 390 million shipments. However this could be taking into account double accounting due to different connectivity models used in the same car, and the discontinuation from 2014 connected cars. Additionally, I would congratulate you for your market segmentation. Thanks for the feedback Juan Sebastian! I am happy to update the numbers. Do you have a reference for me. I found the Visiongain report but didnt detect the 390m. Are the 390m for 2020 or 2025? Would you say that lighting controls in the consumer home automation market also include “natural daylight control” just like automated shades? Or where would you classify these? Do you have any research on the application of IoT in agriculture?